Nine Russian amateur drivers go under the starting pistol on July 31 in a unique 14-day motor marathon from Moscow to London as part of a Jaguar Land Rover Russia promotion. The Russian team will drive in relays using three new Land Rover Discovery Sports and a Jaguar XE, on a journey that will take them across 14 national borders and 6,000 miles. 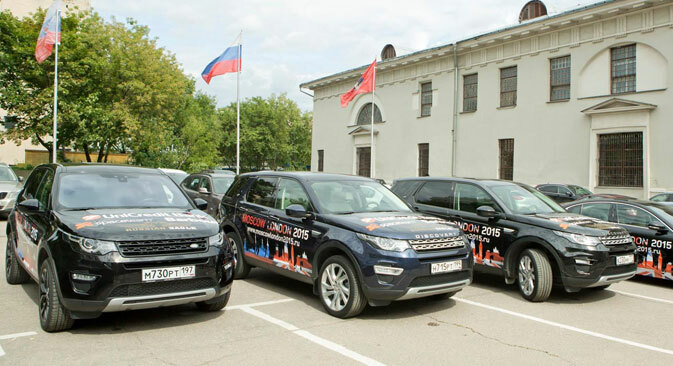 Olga Proskurina, marketing director of Inchcape – the Moscow dealers for the British cars – said that the main destination of the trip “is to get from Russia to the British base factories and back to Moscow." Two of the cars will be provided with the Russian navigation system Glonass, allowing fans to check their current location on the official site of the project, www.moscowlondon2015.ru. The site will be updated daily with blogs from the drivers describing the adventure. The team will drive via St. Petersburg, Helsinki, Amsterdam, Edinburgh, London, Berlin, Kaliningrad and Riga, before finishing in Moscow, provisionally on August 13. As part of the year of Russian literature, drivers are also packing copies of Russian classics with them, with the idea being to swap them during stops for books of local writers.